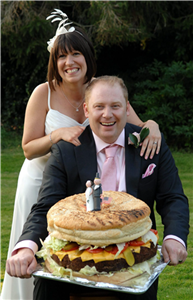 Tom and Kerry Watts with their unusual wedding burger. The American diner believes it to be the UK's first ever giant wedding burger. Mr Watts, a 36-year-old firefighter, said: â€œNot only did I get to marry the woman of my dreams but I also got to have the burger of my dreams in the same day. â€œI could not believe the size of the burger. It was just incredible. Everything has just been amazing. It was the best day ever. â€œWe wanted to do something a bit different for our wedding day and make it a day to remember. The idea of a wedding burger started out as a bit of a joke at first but when the guys at Zaks said that they could do it, I was over the moon. â€œWe live in Poringland and we go to Zaks every other month. We love a burger so the reception was just awesome. He said the idea for their reception at Zaks started when a waitress overheard them discussing their wedding plans at the diner in February, but the giant burger idea was only thought up last week when the Zaks team started creating their rather unusual wedding present for the couple. It took butcher John Baxter, from Burgers Plus, in Norwich, a whole day to create and shape the giant beef patty, weighing 400oz when uncooked, from Zaks' secret recipe. And yesterday the finished burger had to be cooked for three hours. Three chefs were needed to lift it out of the oven before it could be put into the specially made sesame seeded bun, from Merv's Hot Bread Kitchen, in Wymondham. The bun weighed 5kg and staff had to cut it in half using a saw. Then, to finish off the fast food masterpiece, it was garnished with 12 iceberg lettuces, 12 onions, 30 tomatoes, 48 slices of dill pickle, and 2kg of cheese, along with a litre of ketchup and a litre of mayonnaise. Before tucking into the giant wedding burger the 60 guests were also treated to a specially adapted Zaks menu that included a Tom and Kerry burger, an amalgamation of the couple's favourite burgers, surf and turf for Mr Watts and cheeseburger for Mrs Watts. The couple met on a night out in Norwich and Mr Watts proposed to his new wife at Dunston Hall last Christmas, after they had been together for two years. Mr Watts has a daughter called Darcy, 12, and Mrs Watts has a seven-year-old son Ben.